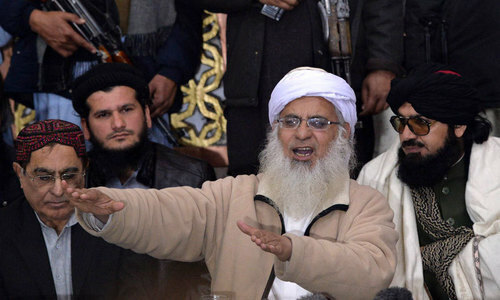 ISLAMABAD: Maulana Abdul Aziz on Friday dodged the Islamabad Capital Territory (ICT) Administration and was able to deliver a sermon at Lal Masjid. Maulana Abdul Aziz lambasted all state institutions and said the judiciary was corrupt because it was the remnant of British colonialism as was democracy. “Democracy is un-Islamic. I am ready to challenge any cleric who claims the democratic system is allowed under Islam,” he said. He criticised the incumbent rulers, said Nawaz Sharif and Asif Ali Zardari were corrupt and without naming him, hit at Maulana Fazlur Rehman for bringing out a million march for the implementation of Sharia in the country, only when he is out of the game. “Why is it that he [is doing so now] and opposed us earlier,” Maulana Aziz asked, adding that “things are getting closer and there will be a change in the system soon”. 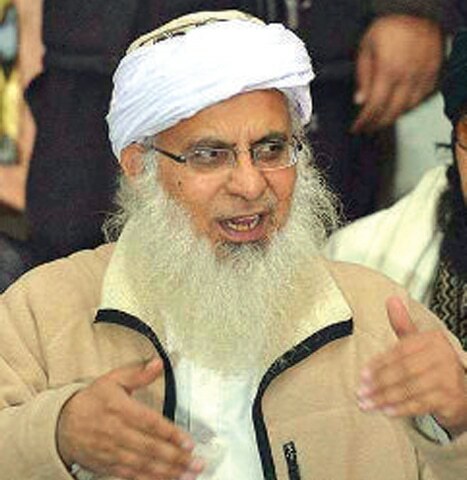 Maulana Aziz made a sudden decision on Thursday evening that he will lead Friday prayers in Lal Masjid when the ICT administration, police and other law enforcement agencies were busy preparing for the March 23 parade. He had also planned to lay the foundation of Jamia Hafsa, a seminary for girls and women, which was deferred till next week. He said Jamia Hafsa should be built on the plot adjacent to Lal Masjid, which used to be a children’s library and was occupied by female students of the Jamia Hafsa before the 2007 military operation. The Jamia Hafsa building and the library were demolished by the government following the operation in 2007 against Lal Masjid. The move also caught police and Rangers posted outside Lal Masjid by surprise. There are usually two Rangers’ vehicles posted outside the mosque on Fridays but there was only one on this day due to heavy engagement. The official prayer leader of Lal Masjid, Amir Siddique, was sidelined and he did not even show up at the mosque at prayer time. Maulana Aziz made a fiery speech in the sermon and said he will not lead the Friday prayers as the ICT administration had stopped him from doing so. Therefore Haroon Rashid, son of Abdul Rashid Ghazi, who was killed in the 2007 military operation, led the prayers. 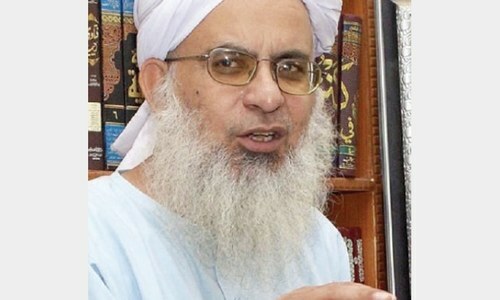 Meanwhile, an ICT administration official told Dawn that Maulana Abdul Aziz tried to dodge the system but he will not be allowed to enter Lal Masjid next week. “We have already sealed Jamia Hafsa H-11 and nobody should underestimate the power of the state,” the official said.Maulana Aziz had tried the same in May last year during the interim government, but the attempt failed. He tried to regain the post of khateeb of the mosque in Nov 2018 as well. Maulana was removed from the post on the orders of the court in 2004 following a fatwa he issued against the army and the operation against terrorists in Waziristan. However, he was reinstated after his release from prison in 2009, but he stirred another controversy in 2014 after he openly extended support to the perpetrators of the Army Public School attack in Peshawar by calling it a reactionary move by the terrorists. His several attempts to get hold of a microphone in Lal Masjid was foiled by the government in 2017 as well. Lal Masjid is a state-owned mosque and Maulana Abdullah, father of Maulana Abdul Aziz, was its first khateeb. After his assassination in the 1990s, Maulana Abdul Aziz was appointed the khateeb by the ICT’s Auqaf Department. He is already over the age of 60 years and has retired as a govt employee, the ICT official said, adding that Amir Siddique has succeeded him. Challenges clerics to prove democracy is allowed under Islam !! Some of these mullahs are so ignorant they make me grind my teeth. No. Aziz must prove it isn't. If this is the level of the PTI government in ensuring the implementation of the NAP then the banned organisation are far more organised than the state institutions. This guy needs to be put behind bars ASAP and be declared traitor. Please book this person and never let him out of jail. Also three could be treason cases filed against him based on whatever he did in lal masjid before. Why is this terrorism inspirer and facilitator not behind the bars? He is alive because of democracy, if had done that in a theocracy he would have lost his head. How will the government satisfy FATF, when it can not take care of one single ‘nobody’? Here we go again, all such anti-state moves are planned by opposition parties to incite people and create unrest through different means. As failed and corrupt politicians have no other options left to be in the news - it is all part of dirty politics. (Gharib Awam ki Awaz). Lock up the haters and anti peace elements like him. Make him a roommate of Khadim Hussain Rizvi behind the bars. If democracy is un-Islamic, your actions of deception, intrigue, and anarchy, are more so. Put him behind bars forever. Incompetent government. Can’t put a hate monger and traitor behind the bar. 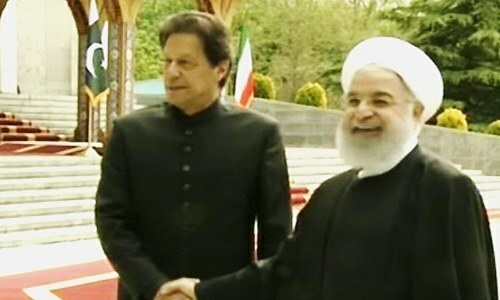 Maulana sahab, what exactly have done that has contributed positively to help Pakistan and it's people and see off the threat from India recently? The answer is obvious, nothing. You are just an agitator for self promotion. 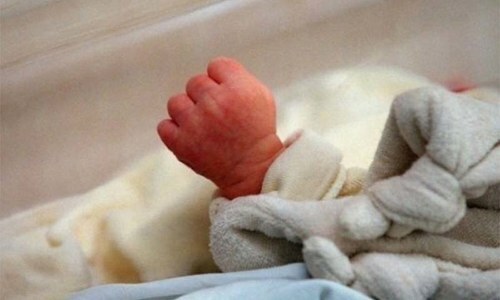 Law breakers should be severly punished. Democracy which actually means " for the people, of the people and by the people" has always been a tangible part of Islam, Islamic doctrine, Islamic history, traditions, norms, values and practices, since day one. When anti state elements like this are allowed to roam free in Islamabad ..... it casts serious doubt on the government's ability and intention to curb such elements. This guy works for foreign agencies. Why is this guy roaming around. One wonders over state's utter failure to tackle this anarchy for the last 3 decades..! This guy is an iniquitous charlaton who has and still continues to challenge the writ of the state. He openly supports terrorist organizations such as the TTP and Daesh. He felt no sympathy whatsoever during the appalling Army Public School Massacre. Why is this terrorist sympathizer not locked up? He left in a burqa and came back in a burqa. When a moulana uses deceit to get attention, he has violated the very principles of honesty and integrity, in Islam. Why are such silly statements even published. People like him should not get any airtime or attention. This man is an enemy of Pakistan and is a menace. He should be put behind bars and the key thrown away. I think people like Abdul Aziz are bigger threat to our country as compare to India. These people have been destroying our culture, values and heritage. It is time for PM Khan to stand up against bigotry like he stood up against Modi recently. Islamabad police was in huge numbers for Bilawal and Zardari. Why they cannot catch is criminal? He already fought against State of Pakistan. Is it not treason? It was a planned sermon... it was not saying hi or bye... it was more than 30 minutes, presumably. LEA let him. How about Rizvi, Aziz and Fazl detained in same cell for violence and anti state cases ?. With people like him around Pakistan does not need enemies. These Mullah people need to be in prison and banned forever. What good this man did so the state has to worry. lock him up. Maulana is correct in all honesty but democracy should be implemented. @Aman, unfortunately thousands of people will riot to free him! Where is the state? He should be jailed for breaking law. Is it the writ of govt? He could never have entered the Mosque, leave aside give a sermon without the State looking the other way. there should be no fear to halt. He should be reprimanded for the violation. So running away in a Burka during a fight ,leaving children and women behind to fend off for the mess you put them in. Thats is Islamic for sure? He must not be allowed to give sermons should be barred for life. He is danger to the peace in the country. His words against Nawaz , Zardari, and Fazal are a fact snd true. Is this a joke with Pakistan Govt.’s writ? Corrupt to the core and nothing else. People like him bring disgrace to Islam. How innocent is ICT administration, dodged by Maulana Aziz. Or was it planned accordingly. What a circus is going on. Shows how incompetent the security agencies and government are. Or may be they are complicit in tis. This man is dangerous. Put him where he belongs before he becomes another Fazulallah. An example of successful NAP IMPLEMENTATION. Let us wait and see how he is being dealt with by the Govt. The world is watching. There must be someone asleep on duty. If it was the Police that is no surprise. Cleric ? he is a coward who hides behind womans veil and is called a "Cleric" such a shame. Why does the government not send Mr. Rao to arrest him? No Sir, He does not know the meaning of the truth. Lal Masjid is built on occupied land without registration and lease. Government NAP-ing or not ? I would love to listen to and understand what this guy says. Unfortunately, I don't know Urdu. This mullah should be in jail for breaking the law. This person is a real danger to our country. But the government needs to be extremely shrewd and tactful in marginalizing him. He should have faced Trial for Treason after lal masjid incident. How is this man still roaming free? It is beyond the comprehension of the common man. the guy who fought the state tooth and nail giving sermons..
interesting comments.. we have been brought up with a mind set that CLERGY can do no wrong..especially the uneducated ones.. If the liberties of the our people are ever destroyed, they will fall by the hands of the clergy. Besides we should encourage our ladies to be educated cos they raise the society as a whole, they raise our future generation..folks..An ounce of an educated mother is worth a pound of clergy. Good to see that None of the comment is in support of cleric. Its a shame on administration that they could not able to guess his presence and even could not able to stop him when his poisonous speech was on. Such people should be put behind bar for life who create hatred in the society, create a bad image of our country and wish to take this country back to stone ages.